meanchris wrote: Sam, I've owned and sold two Executives, and I still have a search for Execs running on ebay, so I'm well aware of what they sell for. Don't let the chancers get you down, you have a good idea of what your exceptionally well kept and high spec'd van is worth, stick with that thought. In its favour along with the above mentioned condition and spec, it has the newer X244 cab which has much better comfort, layout and noise insulation than the previous model, and it has the best engine. These two things are what convinced us to move from our older 1995 X230 Exec and we didn't regret that move as the newer cab and big engine is a much better van. We wish you all the best with the sale, and we heartily agree with Margaret's comments above. Stick to your guns Sir. Chris, based on your undoubtable knowledge and experience of these vans. Based on what my van currently stands at would you look to advertise it without the scooter and rack but with the other fixed extras like tv, computer, satelite dome air suspension etc etc for a fixed price. or would you offer to sell it for a flat bac=sic price with nothing on but extras could be purchased as an add on. Which scenario would you sell it for and at what level based on its milage, even though its an upgraded and perfect engine. Any advice would be gratefully recieved as Ive got no time to argue with time wasters and the like. i just want to let it go for a decent price to someone thats going to appreciate it. With the best will in the world, I think that it's very hard to give good advice Sam, as people's wish lists can be very different, so it's a case of finding the right buyer. These are my somewhat rambling thoughts, I hope that they help. There's a 1998 van, with the old X230 cab, on ebay at the moment for 17,999. My experience of the old van that we had was that it wasn't half as nice a place to be in as the newer cab with its newer upholstery and more modern fittings. The choice of that five years older van at that price, or yours at (say) £2500-4000 more would have been a no-brainer for us. I've said before here that I think that the 2003-2007 vans are seriously undervalued at around £20-27,000 when compared with the older cab vans at £13-19,000. My (amateur) suggestion would be as you said, to perhaps advertise the van at a fixed price without the scooter rack, (maybe a computer is something where people will prefer their own machine too?). I wouldn't be taking off all the useful additions like batteries, inverter, solar panel, TV etc. To my mind they're attractive additions that I'd otherwise have to pay full retail price for if I subsequently decided to have them as a buyer. There's a 2007 Exec on ebay at 27,000 at the moment, which sort of sets the high bar IMHO. If I was in the market for a fully kitted out and well looked after 2003 van I probably wouldn't have balked at (say) 20,000ish for yours. Maybe, if I was selling a top example, as yours appears to be, I'd remove some of the ultra luxury bits (as well as the rack) and set my sights on 20-20,500 - or 19,995 as an absolute minimum. The mileage wouldn't really concern me on that engine as, apart from anything else, I'd only be expecting to add 2-3000 miles a year anyway and I'd realistically expect the chassis to fall apart before the engine reached an excessive mileage. People will likely use it as a bargaining ploy based on what mileage they'd accept in a S/H car. I personally wouldn't give my van away and give in to someone trying to exploit my position. I would accept genuine bargaining points (that will cost money to address) and come away with a price that I'm happy to accept, (as the current owner of our 2005 Exec who is a member here will attest to). Once again, fingers crossed and best of luck Sam. I am a serious buyer and happy to travel anywhere in the uk for the right one. It will have a full 12 month mot when i sell it, Thats how i roll. Ive only had it a year and a bit so all the accessories are less than 1 yr old, no leaks and defo no damp, I have terminal brain cancer and cant see to drive it anymore and my wifes not that bothered to drive it. I dont have any more pics as such, but I thought it was covered quite well, so if you want ill search for some but will need an e mail to send them to you. Please let me know whats missing. Also im not interested in stripping it down as ive allready got a buyer interested, but he has some financial and parking issues to sort out so he cant buy it for a few days or maybe weeks, i dont know, but im not dead yet, so its on the drive waiting for a new home. The new buyer is having his drive and house renovated so cant take it yet. I wont be willing to move on the price, so if your budget isnt around my selling price, id forget it, because i know what its worth and so does the person im waiting for, but if someone comes up in the meantime and offers me cash, Ill sell him as nothing is ever certain till the money is in the bank. I hope Andy and everyone forgives me for being somewhat pointed, but out of the numerous interested parties ive had, 7 or 8 have been dealers thinking cash in a bag will make my knees go wobbly and Ive even had dishonest people looking to rip me off. After a while and so many disappointments, its gets draining. Its outside clean and ready for a test drive and pics are designed to get the juices flowing, feeling and touching is the acid test but everyone wants to deal over the net, sorry but as a seller, i wont sell over the net as I dont want comebacks. Come, test it, inspect it and do your own due diligence but only if your willing to pay the sale price or near it. Dont come and waste 2 hrs of my time then tell me you need to make £5000 on the resale as your a dealer or an entrepreneur just starting out. I was born at night not last night, lol. 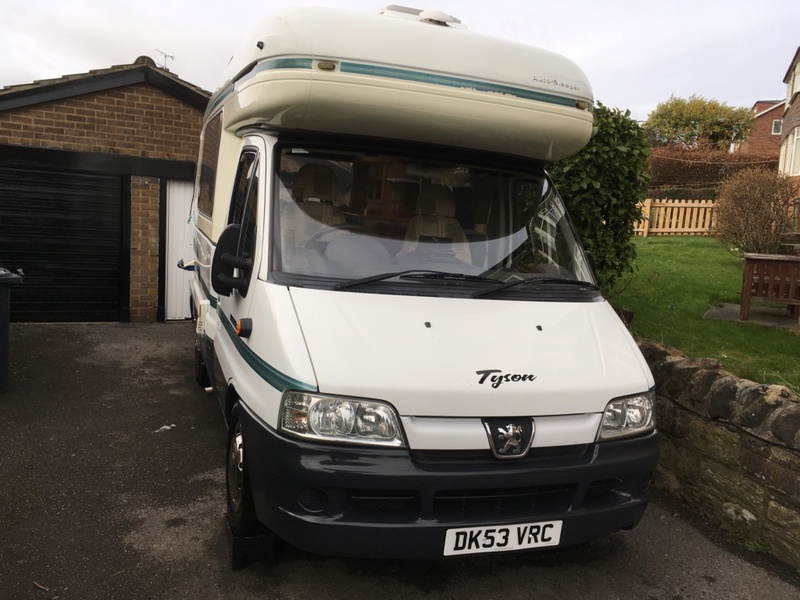 Big day today, MOT time and Tyson flew through the test with no advisories and i had an offer from the garage for £18,000 without the bike rack and scooter, but with the air suspension, tv sat dome, reversing camera, on board computer, flat screen tv and the solar and extra 4 batteries. I SAID NO THANKS and he then admitted that a van in mines condition would get £21k all day long on his forecourt, so im happy about that. Ive just spent 5 hours washing and polishing Tyson for his first real viewing tomorrow. Fingers crossed he will be going to a good home. He is looking like a proud camper and smells absolutely brill, but not something i would have done. I spent 5 hours hard labour getting him ready, mission control spends 2 mins sticking in a bowl of smellies with sticks in on the dashboard and all of a sudden im getting, didnt we do well, lol.